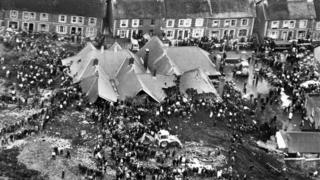 Fifty years ago 116 children and 28 adults were killed by a roaring avalanche of coal waste in the mining village of Aberfan. Coal waste dumped in huge tips on the mountain above the village started to cascade down, becoming an unstoppable and deadly force. It crashed into Pant Glas Junior School and houses directly below the tips, causing death and destruction. Emergency services had a race against time to rescue survivors buried alive. They were joined by local miners and people from the village in the painstaking process of searching for those engulfed in the slurry, before they suffocated or were drowned by water released from a broken water main damaged in the avalanche. Survivors of the disaster on 21 October 1966 have spoken about their experiences that day, and how it changed them and their village forever. When the school was hit Karen Thomas, who was seven years old at the time, and four other children had gone to pay their dinner money in the corridor. "At the other end of the hall, glass started coming down the corridor from the head mistress's room and Nansi the dinner lady jumped on top of us," said Mrs Thomas. "The wall I think more or less pushed us all together and she took the full impact." The five children were trapped alive beneath the body of the dinner lady. "We were shouting at the dinner lady and I was trying to pull her hair, because I could just touch her hair to see if we could have a response from her because she wasn't saying anything to us. I just thought to keep pulling her hair to try and wake her up. "We just didn't know what was happening because we just couldn't hear anyone else. It was just our voices and our screams that we could hear." Eventually a glimmer of daylight shone through as the rescuers found the children. Mrs Thomas said: "It's only down to Nansi that I'm here today. I'll never be able to thank her enough for saving us. She gave her life to save the five of us. I was one of the lucky ones to come out. And I do feel very lucky to be here today. It is something you'll never forget but your life has got to go on." Although he was a pupil in the junior school, Phil Thomas was outside when the slurry hit. He said: "You couldn't see, you could hear, you couldn't see what was coming. It was as if someone was throwing stones at us. "I ran straight forward. I remember something hitting me in the back of the head and I was falling. "I woke pitch black buried, couldn't see a thing, started crying, shouting for my mum." Mr Thomas was pulled from the waste with horrific injuries - he had almost lost an ear, had two head-wounds and a badly injured hand as well as three crushed fingers, which doctors were not able to save. It is the first time Len Haggett, one of the first firemen on the scene, has spoken about the rescue operation that day. "The spirit of the people there that day was incredible," said Mr Haggett. "You went around doing what you thought you could for help where it was needed. If you were ever asked what resources you want at an incident of that nature we had the best in the world, we had the miners. "They were the boys who could shift the slurry. And they worked a very good system. They would be working, and suddenly you would hear a whistle blow and they'd say silence. And how you could obtain silence in those circumstances with that number of people present, is difficult to imagine, and yet it was. "You got absolute silence hoping you would hear a voice or a call so you could rescue them." Mr Haggett was among the rescuers who found Phil Thomas buried alive. He said: "He was terrified understandably. And he was trapped by his feet." He added: "If hadn't come out within a few minutes he would have drowned. The fact that young boy was alive and he'd been saved that was elation, without a shadow of a doubt." Teacher Hettie Williams had a classroom at the front of the school. She said: "When I got out I couldn't believe what I could see, because our end of the room was still standing, that was up, but there was black behind where the classrooms were, you couldn't see anything. It was as if the mountain was right up on the school." Mrs Williams, along with the three other surviving teachers, helped set up a school for the children who had survived the disaster at the local community centre. "When they started to come back the ones that survived they were so frightened to begin with, but seeing us and knowing we had been there as well, they knew they could talk to somebody," said Mrs Williams. "We knew what they had gone through and what we had gone through and we just needed to see one another and see the children smile at you. "Our aim was to make that school as good as it had been, and to remember the people who had worked there. And for us it was to continue that with the children, and to make sure that those children were happy. They were in the same school in a different place, but it was still Pant Glas School." The avalanche also consumed 18 houses on Moy Road, which was next to the school. After working a night shift Gerald Tarr was trying to get some sleep at his home on the road when his dog Buster woke him up. "The dog ran upstairs, banged the bedroom door open, ran into the bedroom," said Mr Tarr. "With that the whole ceiling split right open all the way through, about a foot. With that, the back wall came down on top of me, squashing me down into the bed. The next thing I realised I woke up buried alive." He was found by rescuers and dragged out in time, but had a broken pelvis, crushed shoulder and lacerations across his head. "I can remember it like it was yesterday," said Mr Tarr. "It is still in my mind now. And if I could have saved one of those kids I would go through it a dozen times, if I could just save one."